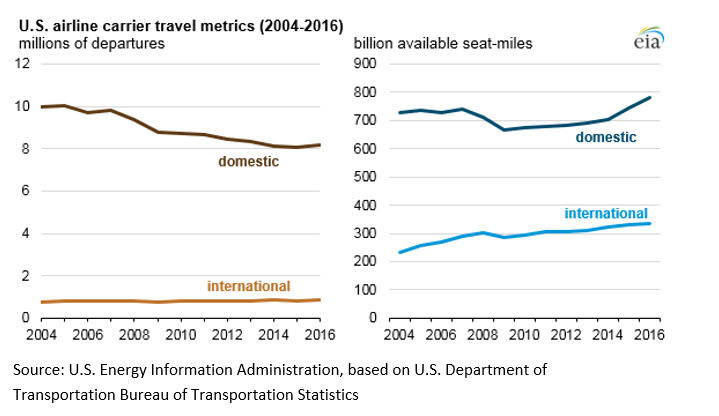 The amount of jet fuel consumed by U.S. airlines increased in both 2015 and 2016, although jet fuel use in 2016 remained 11% lower than its level a decade ago. 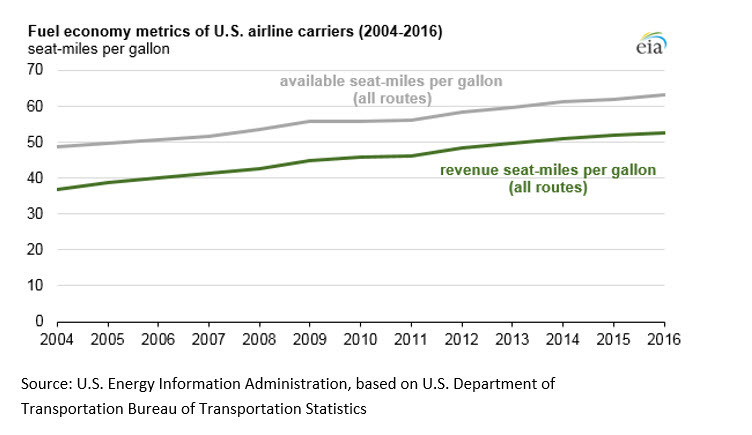 Jet fuel use was lower despite the fact that the number of passengers traveling on U.S. carriers in 2016 was 7% higher than in 2007. U.S. airlines with annual operating revenue of more than $20 million—accounting for virtually all of the value of all U.S. airline operating property and equipment—consumed 17.7 billion gallons of fuel in 2016, according to data published by the U.S. Department of Transportation’s Bureau of Transportation Statistics (BTS). 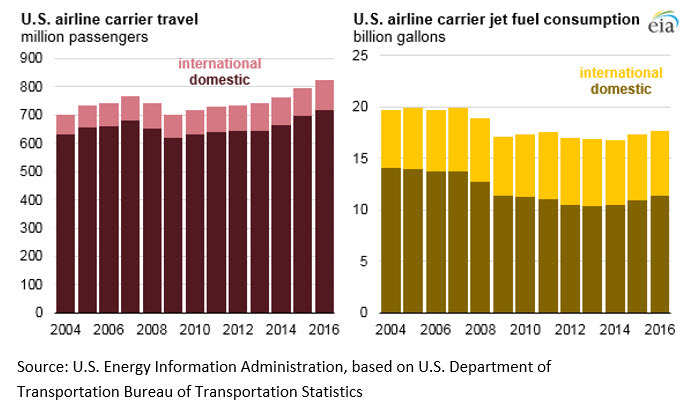 Annual growth in jet fuel consumed by U.S. airline carriers was 3% in 2015 and 2% in 2016—the two highest growth rates since 2004. The Department of Transportation data includes purchases of jet fuel by U.S. airlines and travel by customers on U.S. airlines’ planes at both domestic and international points of departure. Even as the number of flights has decreased, according to BTS, U.S. airlines carried a record 822 million passengers in 2016, up 20% from 2007. Most of these passengers traveled on domestic travel routes. In 2016, international routes made up 9% of flights but 30% of available seat-miles, as international flights tend to use larger planes with more seats and travel longer distances. 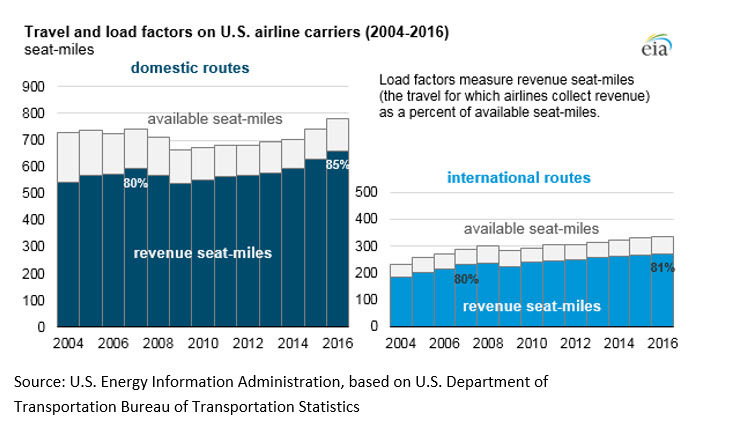 To transport more passengers on fewer planes, airlines increased their load factors, which are measured as revenue-earning seat-miles as a percentage of available seat-miles. Non-revenue seats include unoccupied seats as well as the travel of some passengers such as aircraft employees, air marshals, or safety inspectors. Load factors on domestic routes increased from 80% in 2007 to 85% in 2016. Over the same period, load factors on international routes increased from 80% to 81%. Jet fuel consumption has not increased as much as air travel because airline fuel economy has continued to improve. Air travel fuel economy generally increases as carriers review their commercial fleets to modernize them through purchases or leases of new, more fuel-efficient planes. Since 2007, the average fuel economy of U.S. carriers—in terms of available seat-miles per gallon—has increased from 52 available seat-miles per gallon to 63 available seat-miles per gallon in 2016, up 22%. Similarly, the average fuel economy of U.S. carriers—in terms of revenue seat-miles per gallon—has increased from 41 revenue seat-miles per gallon in 2007 to 53 revenue seat-miles per gallon in 2016, up 27%. The larger gain in fuel economy measured using the revenue seat-miles per gallon metric reflects the effect of increased load factors in reducing the amount of fuel needed to move paying passengers to their destinations. Many aircraft manufacturers have plans to design, re-engineer, and deliver more energy-efficient aircraft and engines into service using advanced manufacturing and engineering. New aircraft, whether acquired to expand capacity or replace existing capacity, are more energy efficient than the average aircraft in the existing commercial fleet. This article is part of UncategorizedTagged airlines, jet fuel, U.S.